Create bootable USB drives the easy way. Rufus is a utility that helps format and create bootable USB flash drives, such as USB keys/pendrives, memory sticks, etc. 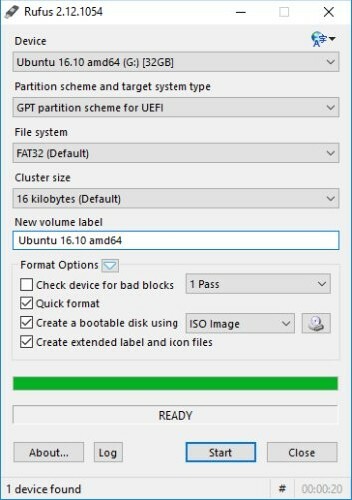 It can be especially useful for cases where: you need to create USB installation media from bootable ISOs (Windows, Linux, UEFI, etc. ); to work on a system that doesn't have an OS installed; to flash a BIOS or other firmware from DOS; you want to run a low-level utility. Despite its small size, Rufus provides everything you need! Oh, and Rufus is fast. For instance it's about twice as fast as UNetbootin, Universal USB Installer or Windows 7 USB download tool, on the creation of a Windows 7 USB installation drive from an ISO. It is also marginally faster on the creation of Linux bootable USB from ISOs. If you create a DOS bootable drive and use a non-US keyboard, Rufus will attempt to select a keyboard layout according to the locale of your system. In that case, FreeDOS, which is the default selection, is recommended over MS-DOS, as it supports more keyboard layouts. All versions of Rufus since v1.1.0 allow the creation of a bootable USB from an ISO image (.iso). Creating an ISO image from a physical disc or from a set of files is very easy to do however, through the use of a CD burning application, such as the freely available CDBurnerXP or ImgBurn. Since version 1.3.2, Rufus support UEFI as well as GPT for installation media, meaning that it will allow you to install Windows 7, Windows 8 or Linux in full EFI mode. However, Windows Vista or later is required for full UEFI/GPT support. Because of OS limitations, Windows XP restricts the creation of UEFI bootable drives to MBR mode. Rufus is produced in a 100% transparent manner, from its public source, using a MinGW32 environment. Arch Linux,Archbang,BartPE/pebuilder,CentOS,Damn Small Linux,Debian,Fedora,FreeDOS,FreeNAS,Gentoo,GParted,gNewSense,Hiren's Boot CD,LiveXP,Knoppix,KolibriOS,Kubuntu,Linux Mint,NT Password Registry Editor,Parted Magic,Partition Wizard,Raspbian,ReactOS,Red Hat,rEFInd,Slackware,Super Grub2 Disk,Tails,Trinity Rescue Kit,Ubuntu,Ultimate Boot CD,Windows XP (SP2+),Windows Vista,Windows Server 2008,Windows 7,Windows 8,Windows 8.1,Windows Server 2012,Windows 10,Windows Server 2016. Rufus supports a variety of bootable .iso files, including various Linux distributions and Windows installation .iso files, as well as raw disk image files (including compressed ones). If needed, it will install a bootloader such as SYSLINUX or GRUB onto the flash drive to render it bootable. It also allows the installation of MS-DOS or FreeDOS onto a flash drive as well as the creation of Windows To Go bootable media. It supports formatting flash drives as FAT, FAT32, NTFS, exFAT, UDF or ReFS filesystems. Rufus can also be used to compute the MD5, SHA-1 and SHA-256 hashes of the currently selected image. Of course, since all of the above does is install the boot records, you will still have to manually provide the relevant configuration files and additional binaries.